Doug Van Nort is an artist, researcher, composer and improviser. His work is concerned with issues of distributed agency and sensorial immersion in technologically-mediated performance contexts. His research-creation activities engage these issues through explorations of the affective and visceral experiences of the sonic and haptic senses, the complex and embodied nature of listening, and the phenomenology of time consciousness. In this context, Van Nort examines improvisation as an important site of investigation and social model for collective inquiry. He creates works that integrate improvisation and collective performance with machine agents, interactive systems and experiences of telepresence. Van Nort regularly presents this work internationally, and recent projects have spanned telematic music compositions, transforming an elevator into an electroacoustic sculpture, interactive textiles, developing machine improvisation systems, interactive music composition for a dance piece based on muscle sound, and performing sonified data streams from NASA's Kepler mission. This work is informed by his background in mathematics, media arts, deep listening practice, music composition and performance, and draws upon disparate areas ranging from perception and cognition, systems theory, performance studies, sound studies, machine learning, signal processing and various forms of ritual. Van Nort's musical work maintains an interest in the boundaries of noise and tone, dense layering, texture, drone, viscerality and the emergence of psychoacoustic effects and patterns that result from experiencing the work in immersive acoustic spaces. Van Nort performs on self-made and idiosyncratic ‘instrumental systems’ that assume a turntable-like, sculptural approach to shaping sound using his hands and voice, and improvisation in partnership with machine processes. He often captures sounds live in performance, while his recorded source materials span instruments and natural environments, including any and all sounds discovered through attentive listening to the world. Van Nort often performs solo as well as with a wide array of artists across musical styles and artistic media. He is a founding member of Triple Point with Pauline Oliveros and Jonas Braasch, has a duo with underground noise legend If, Bwana, and while living in New York he was an active member of the Composers Inside Electronics, founded by the late David Tudor. In recent years he has performed and recorded with dozens of artists including Francisco López, Pauline Oliveros, Stuart Dempster, Al Margolis (If, Bwana), Chris Chafe, Jonas Braasch, Kathy Kennedy, Ben Miller, Alessandra Eramo, David Arner, Anne Bourne, Eric Leonardson, Judy Dunaway, Katherine Liberovskaya, Carver Audain, Paul Hession, Jefferson Pitcher, Francois Houle, Jonathan Chen, and in Sarah Weaver-conducted ensembles alongside the likes of Gerry Hemingway, Min Xiao-Fen, Ray Anderson, Miya Masaoka, Franz Hackl, Mark Helias and Dave Taylor among many others. 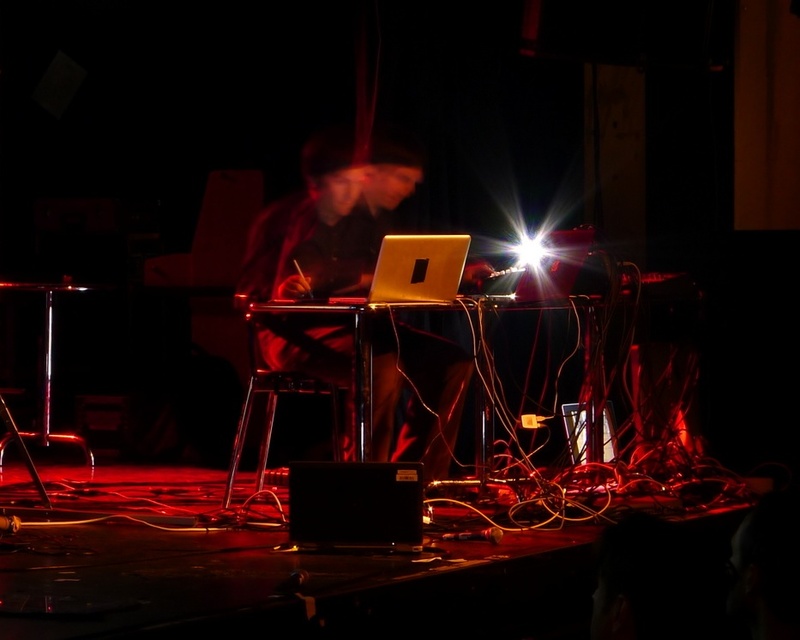 He has performed his work at a range of venues including the [SAT] and Casa del Popolo in Montreal, on WNUR in Chicago, Casa da Musica in Porto, Betong in Oslo, Cafe OTO in London, Skolska28 in Prague, Liebig12 and QuietCue in Berlin, The Red Room in Baltimore, Studio Soto in Boston, The Guelph Jazz Festival, Roulette, Harvestworks, the Flea Theatre, Socrates Sculpture Park, the New Museum, the Miller Theatre, Issue Project Room and the Stone in NYC, at Town Hall (NYC) on an 'intonarumori' as part of the Performa futurist biennial, at EMPAC in Troy, NY, at the International Conference on Auditory Display (ICAD), New Interfaces for Musical Expression (NIME), as part of the legendary Phil Niblock-curated 'festival with no fancy name' at Experimental Intermedia, at the NYC electroacoustic music festival and many other festivals and events across the U.S. and Europe. His creative/research work has been supported and recognized by disparate sources including the NY Foundation for the Arts (NYFA), the NY State Council for the Arts (NYSCA), the National Science Foundation (NSF), the International Computer Music Association (ICMA), the Banting Fellows program, the Canadian Foundation for Innovation (CFI) and the Canada Research Chairs Program. Recordings of Van Nort's music can be found on Deep Listening, Pogus, Zeromoon, MIT Press and Attenuation Circuit among other experimental music labels. In late 2014 a Triple Point 3-CD set, released on Pogus Productions, was produced (edited, mastered, graphic design) by Van Nort. It has drawn praise such as: "Electroacoustic improvisation has the potential to be a music of timbral complexity, of rapid shifts of sound colors within a multi-layered environment...Triple Point lives up to that potential, as would be expected from such a fine assembly of improvisers….Each has a distinctive voice, but the group’s sound is a genuinely collective, emergent object in its own right." (Daniel Barbiero, Avant Music News). In a scholarly vein, Van Nort's writing has recently appeared in Organised Sound, the Computer Music Journal, the Leonardo Music Journal, Kybernetes and the Journal of the Acoustical Society of America. He has also published in a variety of international conference proceedings, and was given the Best Paper Award at the 2010 International Computer Music Conference (ICMC). As a teacher, in recent years Van Nort has led workshops, seminars and courses that are designed towards enhancement of listening and creativity through a mixture of bodywork, breathing/sounding/listening exercises, and the use of analog/digital electronics as a shared medium for these collective experiences. These events leverage Van Nort's experience of Deep Listening (certificate holder) and his life as a practitioner of electroacoustic composition/improvisation and sound-focused art/research. Previously, Van Nort was a research associate and instructor in music and media at Rensselaer Polytechnic Institute, where he conducted research as a core member of an NSF-funded project on telepresence and machine improvisation while teaching courses in electronic arts and architecture related to telematic music, improvisation, immersive environments, listening and sound. Van Nort then moved to Montreal for a prestigious Banting Fellowship at Hexagram / Concordia University, actively collaborating with media artists, performers and scholars as an affiliate of the Topological Media Lab. Van Nort is currently Canada Research Chair in Digital Performance and an Assistant Professor at York University, cross-appointed between the departments of Computational Arts and Music. At York he has founded the DisPerSion (DIStributed PERformance and Sensorial immerSION) Lab, dedicated to explorations in distributed agency, improvisation and technologically-mediated performance. He also works as an Assistant Editor for the Computer Music Journal (MIT Press).